Tired of being chained to your workstation when dictating records or attending a Web meeting? Break free with the Revolabs xTag USB wireless microphone system, designed specifically to provide USB audio for both PC and Mac users without the need to wear a headset or bulky transmitter. The Revolabs xTag shotgun shell shaped wireless secure lapel microphone has the look and feel of something designed by Mercedes-Benz. The .5 ounce xTag was originally created as a wireless lapel conference microphone but it's 100-6800 Hz frequency response and surprisingly good noise cancellation make it ideally suited to speech recognition. 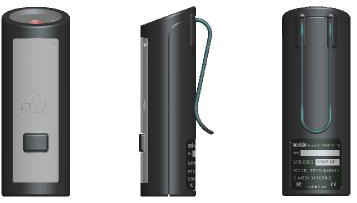 The xTag can also double as a wireless microphone for your telephone but we prefer to use it separately so that we can Echo Dictate information while talking on the phone. Note: The xTag's Achilles' heel is noise cancellation. This unit is better suited to quiet environments. AC power adapter - Allows you to charge the microphone with the base station when a USB port isn't available. 65 foot range as opposed to the 300 foot range of many other wireless microphones. Noise cancellation only works well in quiet to moderate noise environments. Nothing beats the comfort of an xTag because it's a lapel microphone. Eliminating the headset can prevent the unpopular speech recognition cyborg look which most professionals prefer to avoid when dictating in front of clients/customers/patients. 1% higher accuracy (roughly 15% fewer mistakes) than our previous first place microphone. Priced below most other wireless systems. Includes full-duplex USB soundcard. 8 hour talk time and reaches 80% full charge in 45 minutes as compared to the usual 6 hour talk time of most other systems. Charges from any active USB port. No AC power source required. Surprisingly good noise cancellation for a lapel microphone. This microphone will not pick up keyboard clicks, chair squeaks, laser printer from 3 feet away or someone talking on a telephone from 8 feet away. Includes remote dual function Mute and On/Off switch. 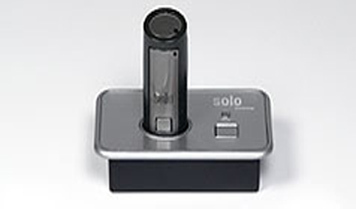 Works best from within a 6 inches and does reasonably well at 12 inches which allows this microphone to double as a wireless Desktop microphone (with optional hardware). I'm thrilled with the RevoLabs wireless microphone you just sold me. Its accuracy is at least as good as the Sennheiser, and it is wonderful to be liberated at last from miles of cable and headsets! I have found its noise cancellation to be very good indeed, and I have [been] able to dictate easily with a radio close by broadcasting the news without increased inaccuracy. I was able to walk away from my computer through four rooms of my (stone- built) house, and it still maintained an admirable level of accuracy. I have already recommended it (and you as the supplier) to the Law Faculty's IT officer, as well as to one of my colleagues who has just started with DragonDictate.